There is now an exhibition of Terra-Cotta ware of more than 200 items (all made in Burgess Hill) on display at the Southdown Garden & Heritage Centre, Hassocks, which can be viewed, free of charge, from 9am - 6pm (mon-sat) and 10am - 5pm (Sun). The museum is situated at the rear of the Cyprus Hall, there is limited parking at the front and rear of the building, however there is a large pay and display car park close by. 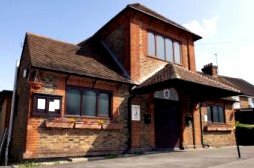 The Cyprus Hall is about 5 minutes walk from Burgess Hill railway station. Please Note: Whilst every effort will be made to open on the dates shown above, we reserve the right to make changes without prior notification and to make admission charges for special exhibitions.